Has anyone replaced the rub rail on a 32? If so, could you share your experience? Should the new rail be flexible or rigid or semi-rigid? TomKat has an aluminum rub rail with black vinyl insert that looks very shabby. 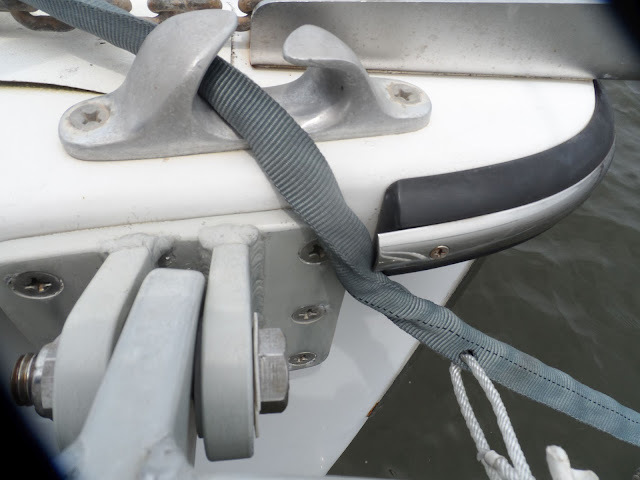 I notice in photos on Thinwater's blog that the rail is black rubber or vinyl, with a nice looking SS cap and I would like to replace with something like that. Any advice and experience is appreciated. That makes a lot of sense. Everything is a compromise. I found a kit from Taco that is the right dimensions and uses what they call a "flex chrome" insert. The rail base looks like it would accept the SS cap at 3/4" if the insert proves unstable in UV or otherwise inadequate so I am going with that option. Mine look like this. The cap is relatively thick SS, and the body is firm rubber. That is 1" webbing in the photo, so it is at least 2 inches wide. And do watch the ends. 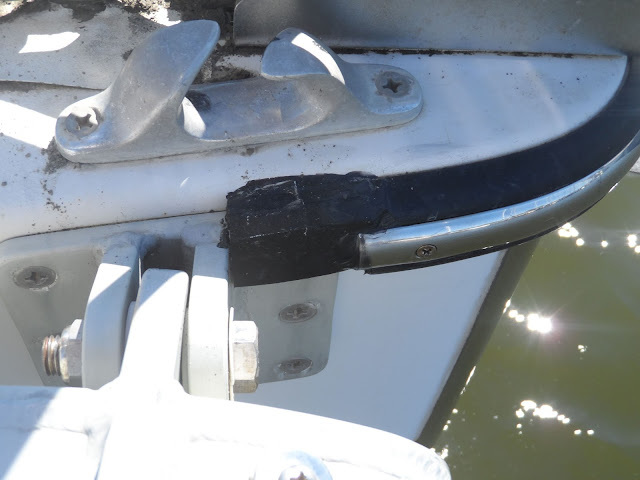 The above is obviously a cutting hazard to mooring bridles, so I filled the space with a carved block of rubber. Worked fine. All it needs to do is keep the rope out of the slot. I see the one from Taco Marine is not sold directly by them, but through their distributor West Marine. If you do this, I would be very interested in the results as the rubrail on Phenix could use a replacement. The TACO rail is only about 1/2 the thickness of mine. The rubber block I used was 3/4", plus the bonding under it and the metal cover above it, for a total of nearly 1". I would ask James Power. I really like having a thick rail that stands out, allowing me to pivot against it when docking, since I mostly singlehand. Better to touch lightly and then slide, than to struggle to avoid any contact and then crunch.